Home > Housekeeping Essentials > What is a Balanced Meal? A balanced meal is one that contains a healthy variety of all the major food groups. You don’t have to have all food groups at every meal to ensure you have a healthy diet overall, but it is a good idea to understand the basic principles of a balanced meal and try to make this your choice as often as possible. When you see TV adverts that are for sugary cereals or fast food, there is often a strapline at the bottom of the screen that says ‘as part of a balanced meal’, but this is always advertising the part of the meal that isn’t balanced! A healthy breakfast is just as healthy with the fruit juice, toast and boiled egg as it is without the chocolate covered cereal! Try to keep your general diet as healthy and varied as possible and then you can enjoy some less healthy treats occasionally, safe in the knowledge that this is not your every day diet. Many dieticians and nutritionalists agree that the ’80 – 20’ rule is a practical guide for healthy eating – eat healthy, balanced meals for 80 per cent of the time and allow yourself fast food, chocolate or other ‘naughty’ treats only 20 per cent of the time. 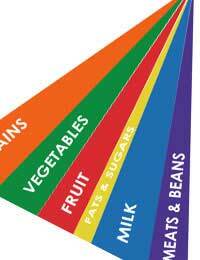 The five major food groups are fats, carbohydrates, fruit & vegetables, meat & protein and salt & sugar. There are two main types of fat – saturated and unsaturated. Neither type is great in large amounts, but unsaturated fat is far better for you. Saturated fats include processed fats like margarine and unsaturated fats tend to be the ‘naturally occurring’ fats such as olive oil. Saturated fats are found in high volumes in ready meals and fast foods, whereas unsaturated fats are found in meat and fish. Carbohydrates have had a bit of a bad press recently as being weight-gaining and bloating. It is true to say that many people feel better by reducing their carbohydrate intake, especially in the evening, but carbohydrates are an important source of energy and help to fill you up. Carbohydrates also tend to be cheap, such as rice, bread and pasta so can be good for feeding a hungry family. Fruit and vegetables are the kings of the balanced meal. They are the only one of the food groups that you can live on, although you would need to have B vitamins. While it is not good to eat too much red meat, some is a great source of protein and certain nutrients, such as B vitamins. Lean meat is the best source of protein as you are not having any extra fat – a grilled fillet steak is perfect. Good sources of lean protein are also chicken and turkey – just don’t eat the skin if you want to keep calories down. Non-meat protein sources include tofu, chickpeas, beans such as haricot, kidney and pinto and cottage cheese. While not really its own food group, salt and sugar is part of a balanced diet. You do not want to eat very much of either, and you would be healthy without them, but a little salt when cooking vegetables really adds to the flavour.